Non-returnable if package is opened. 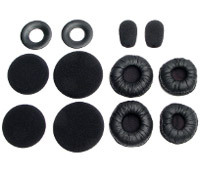 Foam replacement kit for Xpressway and Tria headsets. Includes 2 windscreens, 2 small and 2 medium foam ear cushions, 2 small and 2 medium leatherette ear cushions and 2 cushion mounting rings.